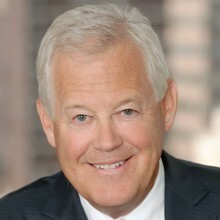 Jack Leslie is Chairman of Weber Shandwick, one of the world’s leading global communications and engagement firms. A strategic communications executive, political consultant and international development activist, Jack brings a long track record of helping clients integrate global political, economic, cultural and communication trends to create innovative, forward-looking strategy and plans. Some of the companies he has counseled include American Airlines, Bank of America, GE, HP, Johnson & Johnson, MasterCard, Merck & Co, Microsoft, Nestle, Novartis, PepsiCo, Pfizer, Siemens, Unilever and YUM! Jack was appointed by President Obama in 2009 to serve as Chairman of the Board of Directors of the U.S. African Development Foundation. In 2016, he was appointed to the President’s Advisory Council on Doing Business in Africa. Jack is a member of the Council on Foreign Relations, Chairman of the U.S. Agency for International Development (USAID) Advisory Committee on Voluntary Foreign Aid, Chairman of Duke Global Health Institute’s Board of Advisors and Chairman of the Ron Brown Scholar Program. He is a former Chairman of the Board of USA for UNHCR (the UN Refugee Agency). Jack has been an advisor to the Colombian Government since 1986, advising five Presidents on critical bilateral issues, public opinion research and strategic communications. He has been instrumental in devising strategies to combat terrorism and narcotrafficking, and implement Plan Colombia, a U.S. program that helped transform security and judicial systems in the country. In January 2016, Jack was honored with the Orden de San Carlos (Order of San Carlos) by President Juan Manual Santos for his work in supporting peace and security in Colombia. The Orden de San Carlos is the highest honor given to a non-citizen of Colombia. Jack began his career as an aide to Senator Edward Kennedy, serving as his political director and as Executive Director of the Fund for a Democratic Majority. He joined Sawyer Miller Group, a prominent political consulting firm, in 1983 and became President of the company in 1985. During the 1980’s and 1990’s, Jack provided political counsel to dozens of presidential and statewide campaigns in the United States, Latin America, Asia and Africa. Jack is a graduate of the Georgetown University School of Foreign Service.